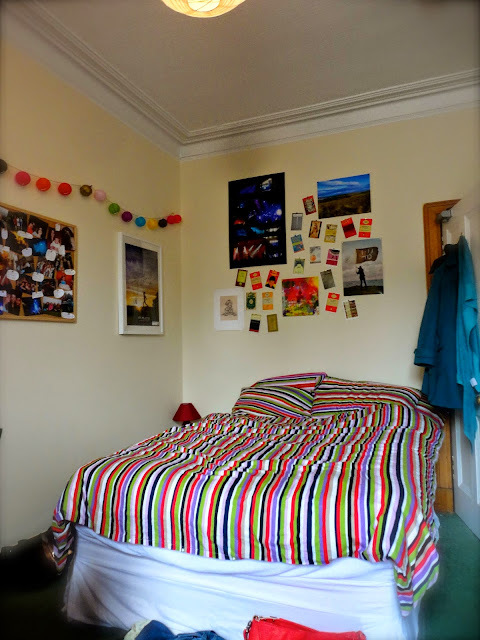 I did a room tour post a few months ago, when I was still living in France, but I'm now back in the U.K. and living in a flat for this year, so I thought I'd share a few snapshots of my room here. For anyone who has seen my last room tour, a few items may be recognisable. I brought back my fairy lights, as I love that the lantern design looks really pretty even when they're turned off. 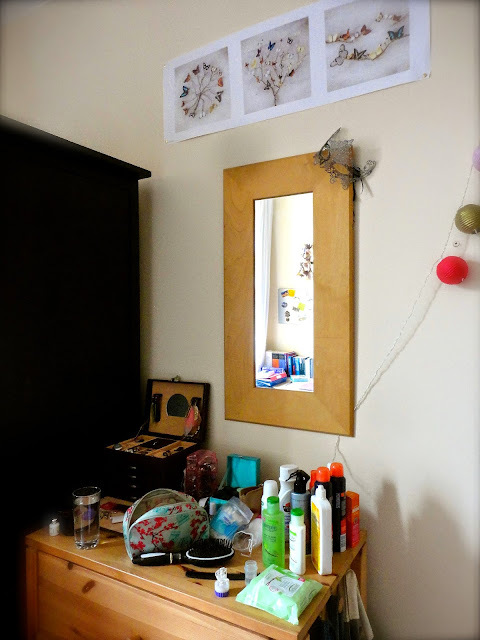 Some of my smaller posters and the photos on my pin-board have also made it back into this room. My two main surfaces are the desk and the chest of drawers. The first is home to all university-related things, including the large stack of books all literature students seem to own, but things like the clock and photo frame make it a nicer work space. It's also right beside the window, so plenty of light available. My calendar and magnet board are above the desk, to aid with organisation of course. The magnets themselves are souvenirs from my European trip, as are the two Venetian masks hanging in the room. The dresser is home to make-up and jewellery, which I try to display nicely where possible, such as in my big purple jewellery box. The bed covers are always an important choice for me, and I love the colours in these that really bring the room to life. The curtains also have the same fabric sewn on to the bottom of them. I've also used the same colour palette throughout the room, with a red rug and lamp and a purple clock, storage box and laundry bag. I think these little touches tie everything together. The bedside table is also home to my CDs and DVDs, as I'm a big fan of having real copies of everything, not just digital ones. The wall decorations are, of course, a big part of the room. 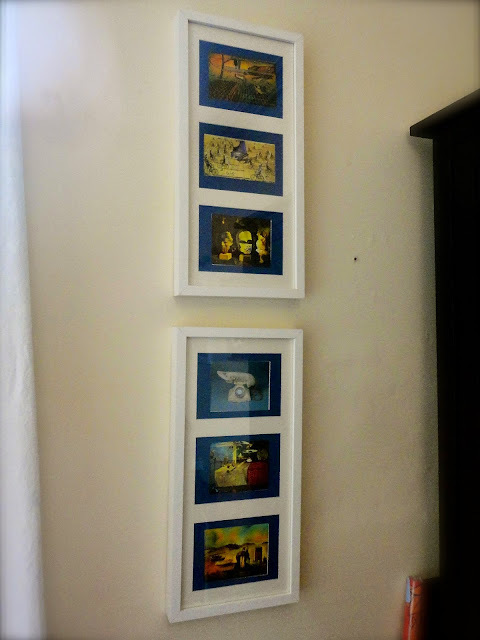 Some are prints that I just liked, while others are more personal to me. 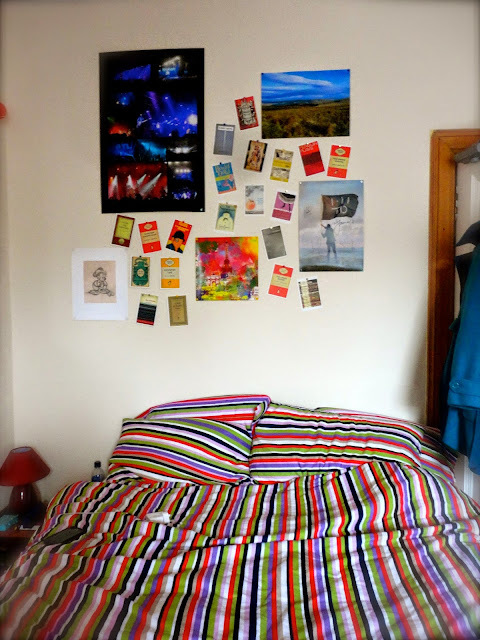 I have my Harry Potter poster, two signed album covers from bands I love (You Me At Six and Canterbury), a collection of Salvador Dali prints, a poster featuring photos I took at various concerts and a selection of postcards featuring book covers. The notice board is also full of photos of family and friends and snippets of song lyrics.